Type I diabetics need to lower cholesterol or run the risk of losing their sight. Already those diabetics who were born with or developed at a young age insufficient insulin regulation (once called Juvenile Diabetes) have a greater risk than the average person of going blind from their condition. Newer research, however, also indicates that cholesterol levels that are above 200 mg/dl increase that risk even more. High cholesterol is dangerous to anyone’s cardiovascular health. The same is true of diabetics. But most people who need to lower cholesterol levels are not at risk for vision problems. Type 1 diabetics on the other hand are. In fact, they are twice as likely to develop macular edema, a condition where fluid builds up in the eye and impairs vision. This condition is even worse, four times so, if the ratio between the good (HDL) and bad (LHDL) cholesterol is off too. Higher HDL cholesterol levels work to control the unwanted high levels of LDL cholesterol, so an HDL reading of over 40 mg/dl is desirable. Diabetics usually run the risk of blindness because their condition affects the retina. Blood glucose levels that are too high contribute to diseases of the retina. With cholesterol, the high cholesterol introduces a completely different cause of blindness, the macular edema, as well. A study conducted by Brigham and Women’s Hospital in Boston analyzed 1,441 people with type I diabetes. Their cholesterol levels were monitored for 6 and ½ years. Those with the highest LDL cholesterol levels were almost twice as likely to have the macular edema. It is hoped that the study leads to aggressive monitoring and treatment of Type I diabetics and their total cholesterol to HDL ratios. Diabetics and those who need to lower their cholesterol can benefit greatly from a diet and exercise program designed to lower cholesterol quickly. 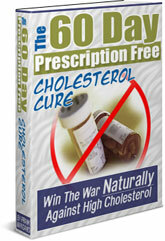 The complete plan can be found in The 60-Day Prescription Free Cholesterol Cure.